Protection • Proposal survives but instead of the Senate floor is sent to interim study. Courtesy of Shane Farver Shadows encroach on Chesler Park in Canyonlands National Park last March. Greater Canyonlands is "a spiritual reservoir" and "a geologic truth that belongs to all of us," author Terry Tempest Williams told a Senate panel Thursday, asking it to advance a resolution seeking unspecified protections for this world-famous landscape in southeast Utah. "It&apos;s local, it&apos;s in our DNA, it&apos;s national, it&apos;s international. There must be a way we can work together so that it&apos;s not Republican, not Democrat," the celebrated nature writer said. But Williams&apos; plea failed to sway a single Republican to advance SJR10 to the Senate floor, where she hoped it would initiate a discussion on how best to safeguard the state&apos;s natural treasures. The Senate Natural Resources, Agriculture and Environment Committee, however, did not kill outright the measure, sponsored by Sen. Jim Dabakis, but instead assigned it to interim study for a year. "I want to protect these lands, but I want to use a different mechanism than federal control," Sen. Evan Vickers, R-Cedar City, told the measure&apos;s supporters who packed the committee room and spilled into the hallway. "I have more trust in the people who use the land." Yet Dabakis, a Salt Lake City Democrat who chairs the state party, cautioned that if the state doesn&apos;t act soon, it may lose a say over what happens to the 1.5-million-acre redrock labyrinth of canyons, plateaus and wind-sculpted sandstone features. He warned of a "shipwreck" in which President Barack Obama could invoke the Antiquities Act to declare Greater Canyonlands a national monument, thereby imposing a designation without much regard for how Utahns want the region managed. But his Republican colleagues were deeply suspicious of the word "protection," fearing it could lead to restrictions that would "lock out" all but those fit enough to hike in. The region has 2,200 miles of routes that conservationists say they do not seek to shut down to motorized travel. Their continued use is compatible with conservation goals, according to Terri Martin of the Southern Utah Wilderness Alliance. "It would be a spectrum of activities. There&apos;s a lot of access there. This is not about closing this place up," she said. While Greater Canyonlands is largely federally owned, about 9 percent of it the state holds in trust for schools. "It&apos;s always a concern for us when people draw lines on a map and talk about special designations," said Paula Plant of the State Office of Education. She was concerned that the costs associated with exchanging state lands would "come out the schoolchildren&apos;s pocket." But most of the speakers Thursday argued this land would generate more wealth and serve education best if drill rigs and backhoes are kept out. The region also harbors wildlife and remnants of ancient cultures preserved in dry caves, speakers said. "If we protect it, visitors will come forever. If we neglect it, no one will come," said Kevin Jones, Utah&apos;s former state archaeologist. 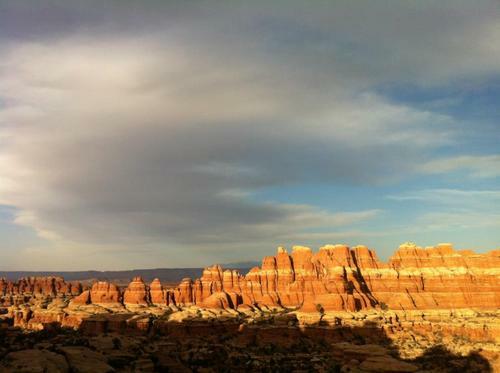 Democratic lawmakers&apos; SJR10 asked the federal government to initiate a public process for protecting the 1.5 million scenic and remote acres of canyons and mesas surrounding Canyonlands National Park. The measure was referred for interim study by the Senate Natural Resources Committee Thursday.